As in previous years, orange shipments to Korea must be free of Fuller rose beetle (FRB) and California red scale (CRS). 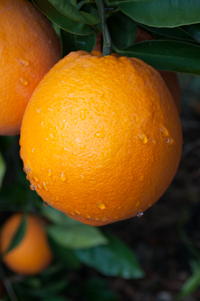 Growers desiring to qualify oranges for export to South Korea must comply with the FRB protocol during the 2017-2018 shipping season. 1. Skirt-prune trees to prevent FRB from climbing branches to enter the tree. 2. Make at least two pesticide treatments as outlined in the University of California Pest Management Guidelines at http://ipm.ucanr.edu/PMG/r107300311.html. 3. Implement weed control to prevent FRB from climbing into trees from weed bridges. The protocol requires treatments with pesticides that are effective in controlling FRB. If the treatment is not made with a University of California recommended pesticide, the treatment will not meet the requirements of the protocol. The U.S. Department of Agriculture’s Animal and Plant Health Inspection Service will be monitoring grower compliance with the protocol by reviewing pesticide application records. If the pesticide treatments are not made with approved pesticides, those groves will not be eligible for shipment to Korea. Shipments to Korea must also be free of CRS, but there is no formal protocol for CRS control. CRS and yellow scale are armored scales that are distributed throughout the citrus-growing regions of California, except in parts of the Coachella Valley where they are under an eradication program. Management of California red scale and yellow scale varies according to location in the state and the other pests present in the orchard. More information about CRS control can be found at http://ipm.ucanr.edu/PMG/r107301111.html.